Before proceeding further, be sure to check out both API posts if you haven’t already. 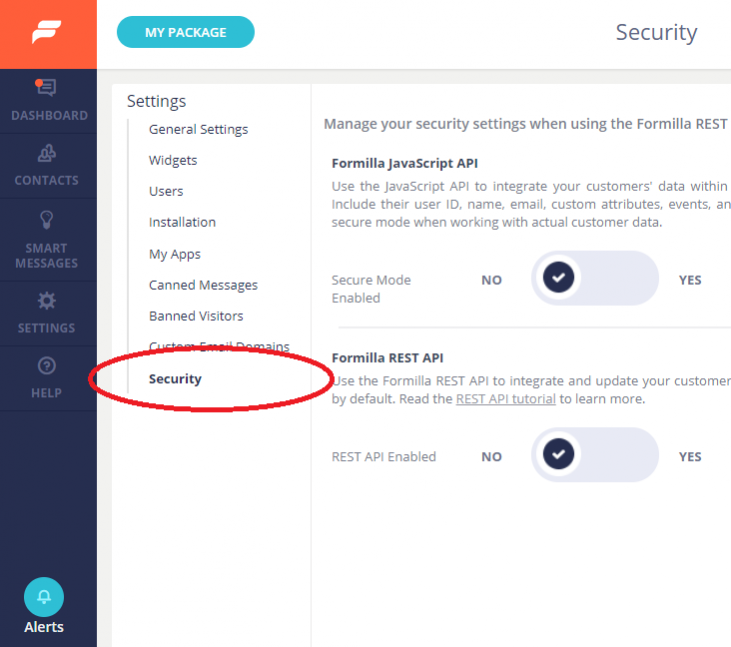 Note: if you’re using Formilla with a Wix website, integration of your data is not supported and the security settings referenced below will not be displayed. First, simply login to your Formilla account as the Account Owner and then click Settings from the left menu. On the next page, choose Security from the sub-menu as shown. Note: be sure you’re logged in as the Account Owner, otherwise you won’t have access to the Security page. You have now successfully enabled secure mode and a Secure Key should be displayed. Note: obviously, do not share your Secure Key publicly with anyone and be sure to keep it safe! Don’t worry, all major platforms and languages will have a method to help you generate the HMAC. Below, I’ve listed a few examples that you may find useful. You’ll notice the User ID is being used to generate the HMAC, however if you’re not using a User ID (e.g. a customer ID, account ID, some other unique identifier, etc.) to uniquely identify each logged-in user, then email address is required as the identifier and should be used when generating the HMAC. Note: please keep in mind that this Java example needs a reference to the Apache Commons Codec package to work successfully. Note: remember, when integrating your users’ data into Formilla, you need to have the script code installed manually on your site and should not be using our plugins. Please be aware that if the generated HMAC is invalid, the user data won’t be integrated into your Formilla account and will cause the script to fail when loading. How do I enable the Formilla REST API? 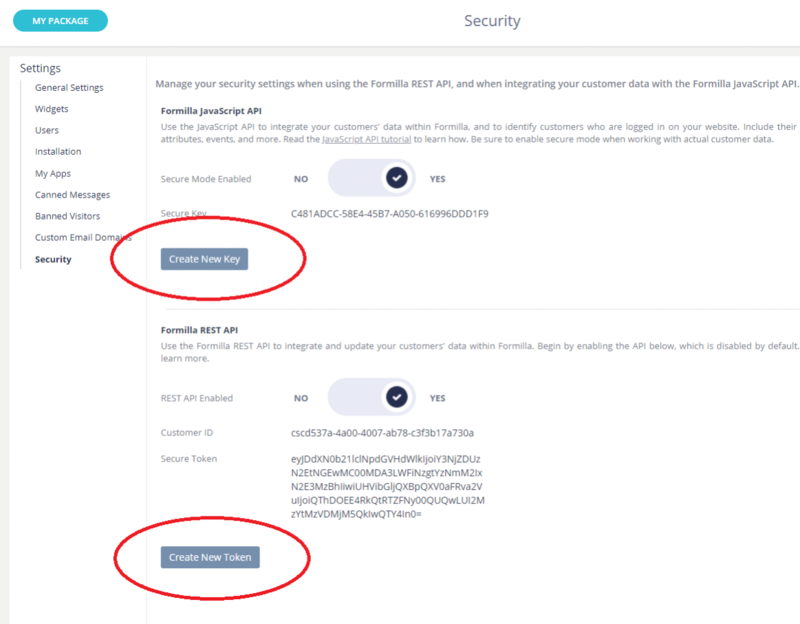 As mentioned previously, the REST API must be first enabled if you plan to use it to integrate your users’ data inside of Formilla. Login to your Formilla account as the Account Owner and then click Settings from the left menu. On the next page, choose Security from the sub-menu on the left side. Simply toggle the REST API Enabled option to Yes under the Formilla REST API heading. Formilla REST API returns standard HTTP response codes. You can learn more about our REST API at this link. In the event you need to generate a new Secure Key or Token, you can do so by clicking the Create New Key or Create New Token buttons on the Security page, and then click OK on the confirmation dialog that appears. Of course, changing your key/token will require you to update your code to use the new value(s).